The transfer time is approx 5 - 10 minutes and is free of charge. 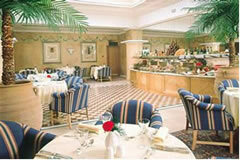 The Hotel offers full Health Club facilities with a wide range of health and leisure facilities. Located adjacent to the National Exhibition Centre, near to the airport, the hotel offers premium accommodation, a choice of restaurants plus leisure club with pool. Have en-suite bathrooms, air-conditioning, tea & coffee tray, hair dryer, TV with games and pay movies, telephone, internet, iron, ironing board, trouser press. One Child under 15 can share free. Specially adapted disabled rooms available. Hearing loop at Reception. Designated disabled parking. Disabled public toilets. Cars will be parked on site at the hotel, at owners risk. Security barriers & regular patrols in place. The hotel offers a courtesy bus service to and from Birmingham International Railway Station.Monorail from train station takes you directly into the airport. The bus leaves the hotel on the hour and half hour. Guests should use the courtesy telephone. The Boulevard Restaurant offers a buffet style carvery, La Primavera serves international cuisine, Miller's Bar & Grill offers informal dining and the lounge bar serves light meals. 24 hour room service also available. 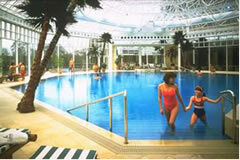 Hilton Birmingham Metropole offers full Health Club facilities with a wide range of health and leisure facilities that include' Living Well Gym', spa pool, sauna and solarium. 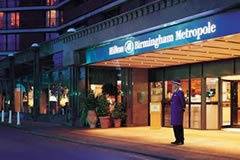 Very comfortable single night stay at the Hilton Metropole Birmingham prior to our flights. Professional and efficient reception and concierge, pleasant room and en-suite, very comfortable bed and no aircraft noise. Friendly bar service and club sandwich was very good. Breakfast a bit pricey at Â£20 each, so we waited to eat at the airport. Considered room rate was good value as it included 8 days parking, and free shuttle to and from the airport/railway station. Would definitely stay here again if flying from Birmingham. All went very well, upon arrival, suggest you check in at desk before parking, as you need a ticket in the car to prove you are valid, otherwise you may have to walk back to the car to place ticket. However, our car park man did it for us, nice guy! Due to security issues at Birmingham Airport, the courtesy mini bus will now take you to Birmingham International Train Station where upon arrival you can catch the shuttle direct to the airport. Transfers run approximately every 30 mins. on request, taking 10 minutes (longer during heavy traffic). Guests can use the free telephones in the airport or the station to ask for the bus to collect them.